The first sign was put up today Thursday December 1, 2011 by the City’s Street Department. Anthony Prieto, Maintenance Crew Leader, put up the first “Evacuation” and “Entering Tsunami Hazard Zone” signs at La Marina and Shoreline. 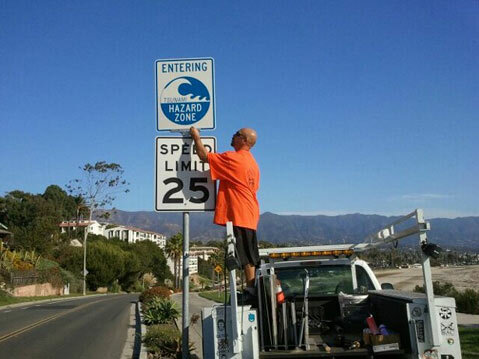 In the next several months City Street Crews will put up a total of 58 signs along the affected areas of our coastline. These signs will assist the City of Santa Barbara in joining with other coastal communities in becoming a TsunamiReady Community. The signs are both directional and educational and have been provided to the City at no cost from the California Emergency Management Agency (CalEMA).